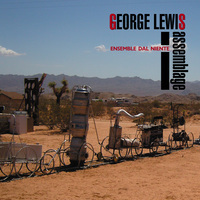 “Assemblage.” George LEWIS: Mnemosis (2012)1; Hexis (2013)2; The Mangle of Practice (2014)3; Assemblage (2013)4. Ensemble Dal Niente: Emma Hospelhorn1,2,4 (fl), Katie Schoepflin1,2,4 (clar), Taimur Sullivan4 (sax), John Corkill1,2, Gregory Beyer4 (perc), Ben Melsky4 (hp), Mabel Kwan1,2, Winston Choi3,4 (pno), Tarn Travers1,2, Minghuan Xu3,4 (vln), Ammie Brod1,4 (vla), Chris Wild1,2,4 (vlc), Michael Lewanski1,2,4 (cond.). New World Records 80792 (1 CD) (http://www.newworldrecords.org/). Beyond the intellectual considerations, these four high-wattage pieces are invigorating and brilliantly executed. An important release. YES. Johannes BRAHMS: Symphony No. 1, Op. 68 (1876); Symphony No. 2, Op. 73 (1877); Symphony No. 3, Op. 90 (1883); Symphony No. 4, Op. 98 (1885). 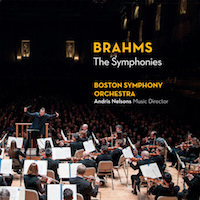 Boston Symphony Orchestra, Andris Nelsons (cond.). BSO Classics 1701/03 (3 CDs) (http://www.bso.org/). Assembled from live recordings, this is one of the liveliest Brahms symphonies series in ages. Do they always play like this in concert? YES. 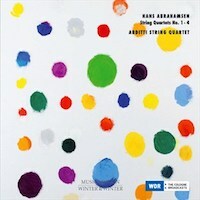 Hans ABRAHAMSEN: String Quartet No. 4 (2012); String Quartet No. 3 (2008); String Quartet No. 2 (1981); 10 Preludes (String Quartet No. 1) (1973). Arditti String Quartet: Irvine Arditti, Ashot Sarkissjan (vln), Ralf Ehlers (vla), Lucas Fels (vlc). Winter & Winter 910 242-2 (1 CD) (http://www.winterandwinter.com/). Could it be the Arditti foursome’s stout indifference? No, it’s probably the aloof music itself. These quartets make awful calling cards. NO. 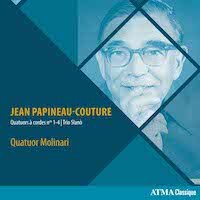 Jean PAPINEAU-COUTURE: Quatuor à Cordes No. 1 (1953); Quatuor à Cordes No. 2 (1967); Quatuor à Cordes No. 3 (1996); Quatuor à Cordes No. 4 (ca. 1996-2000, incomplete); Slanò, Trio d’archets (1975). Quatuor Molinari: Olga Ranzenhofer, Frédéric Bednarz (vln), Frédéric Lambert (vla), Pierre-Alain Bouvrette (vlc). ATMA ACD2 2751 (1 CD) (http://www.atmaclassique.com/). An influential Canadian who matured into expressive dissonance without serialism. The incomplete No. 4 and the string trio stand tall. MAYBE. 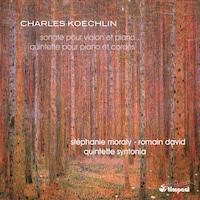 Charles KOECHLIN: Sonate pour violon et piano, Op. 64 (1915-16)1; Quintette pour piano et cordes, Op. 80 (1917-21; ed. Otfrid NIES, 2017)2. Quintette Syntonia: Romain David1,2 (pno), Stéphanie Moraly1,2, Thibault Noally2 (vln), Caroline Donin2 (vla), Patrick Langot2 (vlc). Timpani 1C1241 (1 CD) (http://www.timpani-records.com/). Following a warm and tuneful violin sonata, imagine if Schoenberg were French and despondent and had taken a crack at a Piano Quintet. MAYBE. 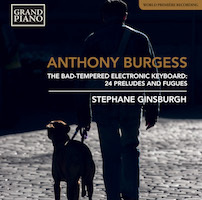 Anthony BURGESS: The Bad-Tempered Electronic Keyboard: 24 Preludes and Fugues (1985); Finale: Natale 1985 (1985). Stephane Ginsburgh (pno). Grand Piano GP773 (1 CD) (http://www.grandpianorecords.com/). As did Bach and Shostakovich, Burgess circumnavigates all keys. But despite proficiency with snappy material, these 24 do not penetrate. NO.